Delkin's newest DIMA Award winning accessory is the Fat Gecko camera mount. The Fat Gecko is a dual suction cup mount that allows all photo and video enthusiasts to quickly and easily create photos and videos in any situation. The Fat Gecko suction cup mount allows users to secure cameras to motorcycles, cars, trucks, airplanes, or any other smooth, flat, non porous surface. The blend of rugged design and ease of use makes Delkin's Fat Gecko camera mount optimal for use in a multitude of situations. Fat Gecko's suction cups are so strong they can hold a eight pound camera and the double knuckle design and 2" extension tube allow for 360� tilt, 360� turn & 360� rotation for all the best filming angles in any activity. The � x 20 tripod mounting screw means users can use virtually any digital still or video camera on the market. In addition, the suction cups use a quick release function to make attaching and detaching you camera easy and fast. With four adjustable joints and an optional extender bar, it's easy to set up shots over a windshield, around an instrument panel, on top of handlebars, or anywhere else that a standard tripod or camera mount wouldn't normally hold up - this is one extreme mount for extreme conditions. The � x 20 tripod mounting screw means you can use virtually any digital still or video camera on the market. Steel frame construction is rugged and durable in design and construction, this steel mount can withstand the most extreme turbulence. Loosen the top-most clamp to remove the standard � x 20" photo mounting screw and the Fat Gecko can adapt to mount an array of other devices, including GPS systems, aircraft antennas and more. Allows for 360� tilt, 360� turn & 360� rotation for all the best filming angles in any activity - whether the mount is attached to an airplane canopy above your head or the side of your Ducati. 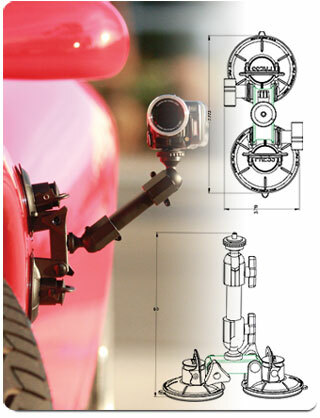 Secure cameras to any smooth surface including; motorcycles, cars, airplanes,and more. Fat Gecko's suction cups are so strong they can safely and securely hold a camera weighing up to eight pounds. With Fat Gecko you can use heavier, more advanced video cameras to provide the best footage possible. 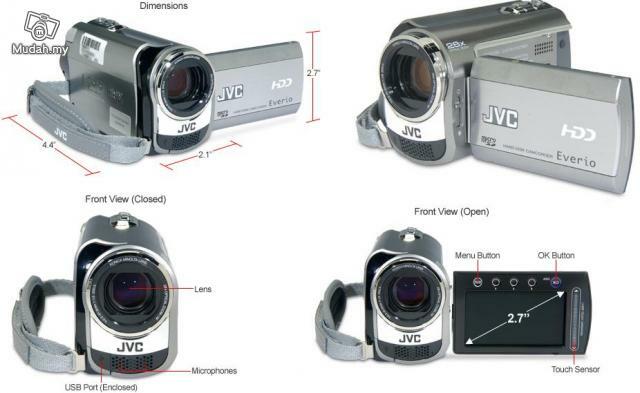 securely attach any standard camera or camcorder to the vehicle or object of your choice. The Fat Gecko Mini is ideal in situations where size and weight are critical, especially in extreme sports where a compact camera is preferred and dual suction isn't necessary. With an adjustable joint and a 3" extension bar, it's easy to set up shots over a windshield, around an instrument panel, over a binding, or anywhere else that a standard tripod or camera mount wouldn't normally holdup - this is one extreme mount for extreme conditions. Attaches to any smooth surface; surfboards, motorcycles, wakeboards, ATVs, helmets, windows and more. suction dia kuat ...tgk kat youtube..dorang mount kat kereta~~ laju lak tu.. hehe..
ko kena amik satu ni yash. benda2 ni memang bguna utk konvoi. lekat kat kuda, and action! Camera pun dah dpt.. insyaallah.. dpt duit sewa budak2 rumah bleh angkat..
kubuntu wrote: Nie berapa RM nie..? ?